This adorable smocked, short sleeve English Soldier romper & bib set is made from soft 100% mid-weight cotton. This adorable outfit is perfect for any special occasion. Royal baby collection! 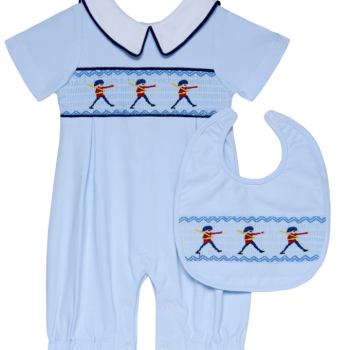 This adorable hand smocked, hand embroidered short sleeve shortie romper & bib set is made from soft 100% pima cotton. This adorable outfit is perfect for any special occasion. Royal baby collection! 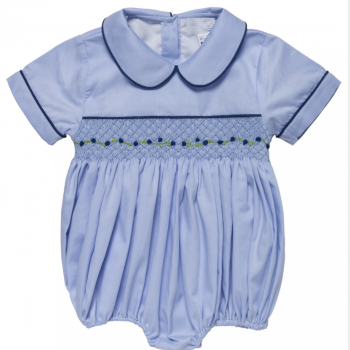 This adorable hand smocked, hand embroidered romper is made from 100% blue pique cotton. This adorable outfit is perfect for any special occasion. 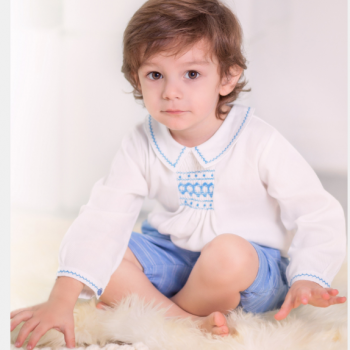 This adorable hand smocked, hand embroidered long sleeve romper made from a blend of 80% cotton, 20% Polyester. This adorable outfit is perfect for any special occasion. Royal baby collection! 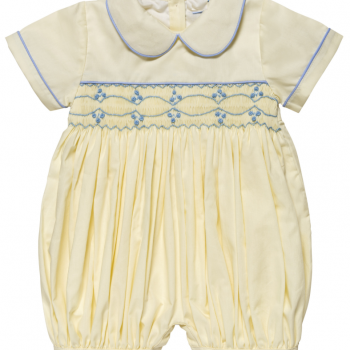 This adorable hand smocked, hand embroidered romper is made from 100% cream cotton. This adorable outfit is perfect for any special occasion.